Before getting started with cooking the brisket, take the time to prepare all secondary ingredients- namely, the Mexican rub and the brisket jus. For the Mexican rub, simply mix the ingredients listed above until the spices are distributed evenly. For the brisket jus, begin by melting the butter over medium heat. Then add the onions and garlic. Cook just long enough to sweat the onions, then add the Chipotle peppers. Break up the peppers with a wooden spoon, then add the liquid ingredients. Simmer for 5 minutes but don’t bring the jus to boil. You want the flavors to come together without reducing the mixture. Onto the brisket. Trim any excess fat, loose meat and silverskin off of it, then apply a layer of all-purpose rub. Now apply a coating of the Mexican style rub. 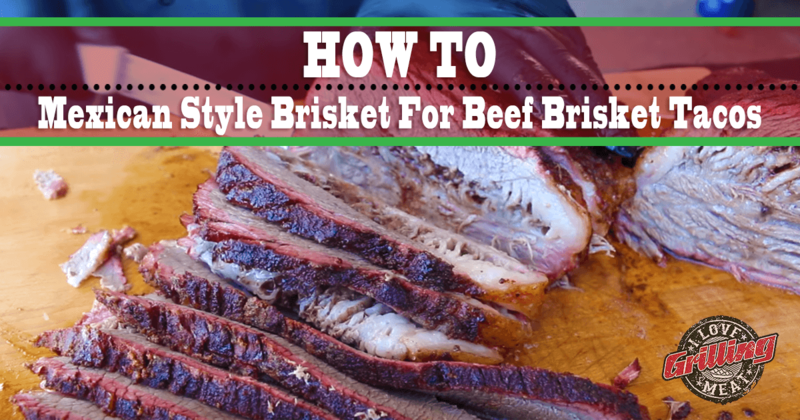 Whole briskets can take a lot of seasoning, so don’t be scared to use a good amount of it! Time to fire up the pit! You’re aiming for the 275°F range. Smoke for about 3 hours, until the color is right. At this point, place the brisket in a roasting pan, and pour the jus in there with it. Insert a thermometer probe to the thickest part of the flat, cover with foil and place back on the smoker. Cook until internal temperature reaches 204°F. Then remove from heat, allow the steam to escape from the pan for a few minutes, then place it in a dry cooler to rest. Finally, time to assemble your tacos! You can either shred or slice the meat. Top with fresh ingredients, like cilantro and onions, and drizzle with lime juice or sauce. Enjoy your beef brisket tacos!